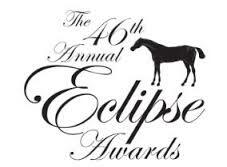 The National Thoroughbred Racing Association, National Turf Writers and Broadcasters, and Daily Racing Form announced Jan. 18 that the 46th annual Eclipse Awards ceremony will be televised live on TVG2 and also streamed on multiple outlets Jan. 21, beginning at 8 p.m. ET from the Sport of Kings Theater at Gulfstream Park. The Eclipse Awards consists of 17 human and equine categories, including the coveted Horse of the Year trophy. In addition to TVG2, the following websites will provide live video coverage: XBTV.com; gulfstreampark.com and drf.com. NBCsports.com will pick up live coverage of the ceremony beginning at 10 p.m. ET. The Eclipse Awards ceremony also is available via satellite to subscribers of Roberts Television Network’s DISH Network Package and as part of its Online Streaming Package, which are available at www.rtn.tv and can be viewed on desktop computers, tablets, mobile phones, and Roku Streaming Media Players. Tickets to the Eclipse Awards are available for $425 each. For additional information, please contact Casey Hamilton of the NTRA at chamilton@ntra.com.